Mapo tofu is a very traditional Sichuan dish that is spice-intensive. So for non-spicy eaters like me, that can be a problem, especially when you craving for something warm and hot on a cold summer day. 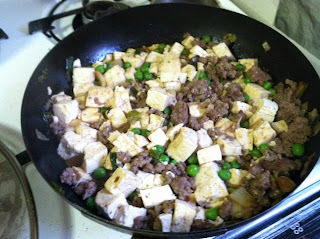 Here is my rendition of add-your-own-heat mapo tofu. 1. Marinate the ground beef in a healthy splash of soy sauce and a dash of sugar for 10-20 min. 2. Meanwhile, cut up the tofu in bitable chunks. 3. Oil up a frying pan, dump in the scallion and turn down the heat to medium high so it doesn't burn to a crisp. 4. Dump in the marinated ground beef, poking it around until it's semi-browned. 5. Put all the tofu pieces and green peas into the frying pan. Note: you can blanch the tofu first by putting it in boiling water, and then fry it. 7. Mix your hot sauce evenly around the tofu, beef and peas. 8. Wait until all the meat is browned, and the flavor is infused into the tofu. You may have to taste to adjust the reasoning. This pairs nicely with a bowl of steaming rice. I infused mine with chicken stock and some butter to add flavor. Unfortunately 1/5 of the rice got stuck at the bottom because I kept it on warm for too long, but still tasted pretty good.